The Children’s room is painted a soft rosy pink and has patterned wall-to-wall carpet. 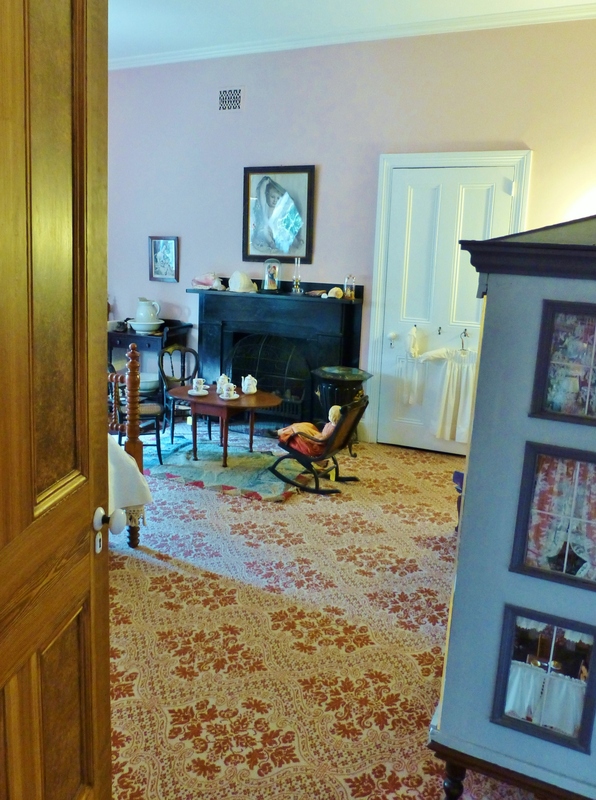 The room is simply decorated and features many wonderful Victorian Period toys. Victorian children’s rooms were not often treated to the ornate patterns and fancy decor, as seen in the more public spaces. They were most often decorated like the servants quarters in a plain understated fashion. Welcome back to my exclusive tour of the Ebenezer Maxwell Mansion. I’ve really been enjoying this series of sharing images from the interior of an amazing Victorian home on the outskirts of Philadelphia, PA. 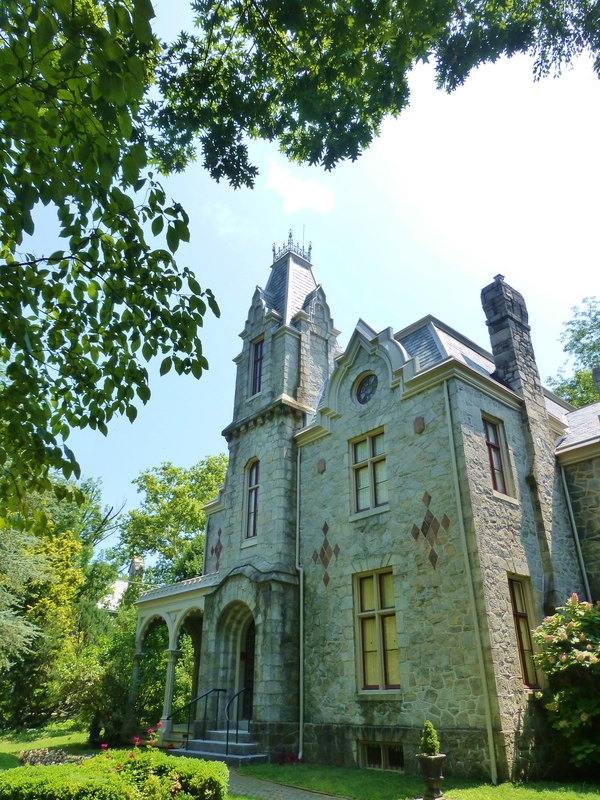 The Ebenezer Maxwell Mansion, a fine example of Victorian Gothic and Second Empire design. Last time we toured the Study and Dining Room. 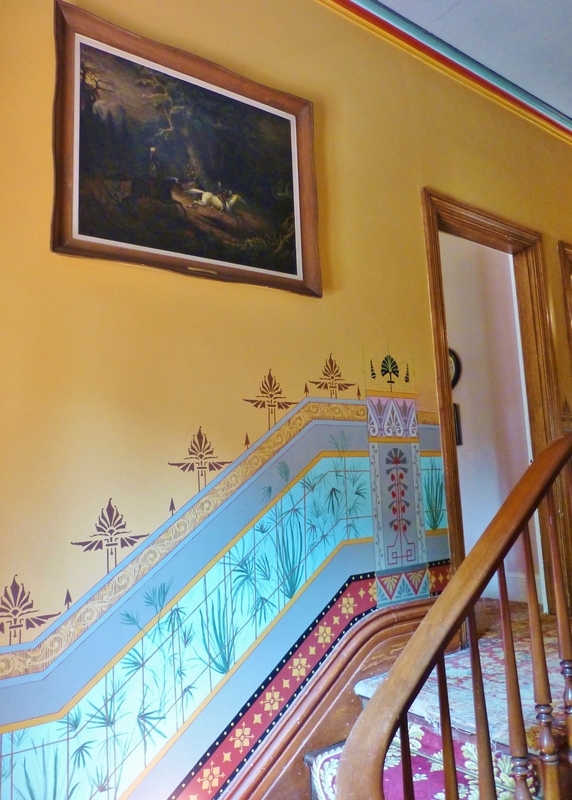 Today I will take you upstairs to share a bit about the upstairs hallway, and details of the Children’s Bedroom. As we ascend the stairs from the foyer, a beautiful handpainted wainscoting takes shape on the landing. This colorful painting is in the style of the Aesthetic Movement with a little Asian influence thrown in. The detailed painting has been restored exactly as the original, a portion of which is on view behind plexiglass in the upstairs hallway. At the top of the stair is the entrance to the Children’s Bedroom. The Children's room is painted a soft rosy pink and has patterned wall-to-wall carpet. 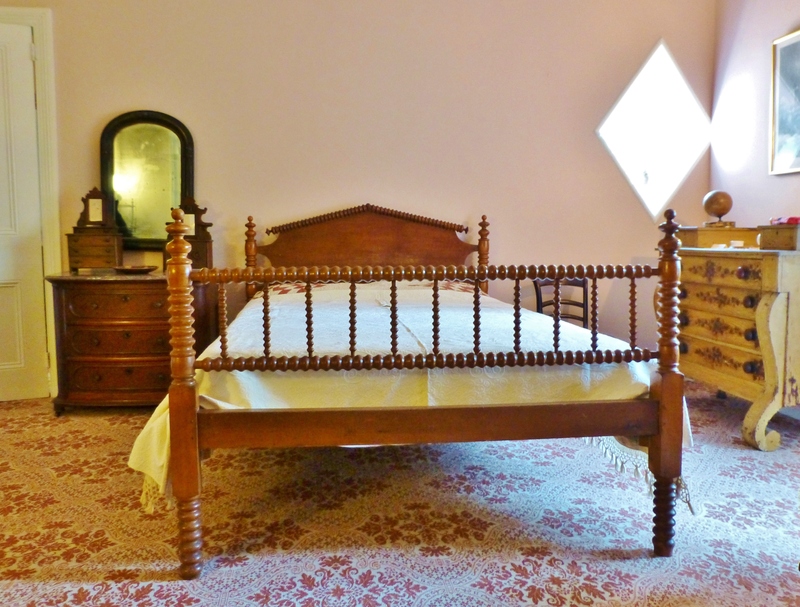 The room is simply decorated and features many wonderful Victorian Period toys. Victorian children’s rooms were not often treated to the ornate patterns and fancy decor, as seen in the more public spaces. They were most often decorated like the servants quarters in a plain understated fashion. Assembled around the slate fireplace mantel is a child sized table, complete with it’s own little hooked area rug and miniature tea set. Children’s tea sets, toys and furniture in good condition, like these, are relatively rare, since they were often damaged during playtime. There’s even a rocking chair for the antique doll. Check out this coal bin sitting by the hearth in the children’s bedroom. Decorative coal bins are containers to store coal for your fireplace or stove. Since a bucket full of coal sitting out in full view isn’t all that attractive, the Victorians devised coal bins that hold a substantial amount of fuel at the ready, yet the containers also serve as a decorative element in the room. 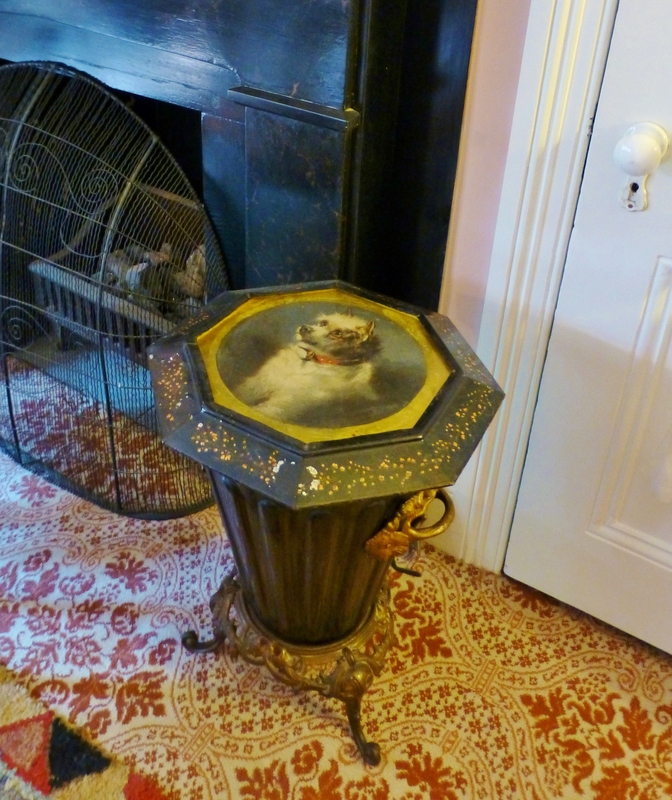 This one features a precious dog portrait on the embellished octagonal top. In the corner is a Renaissance Revival style crib with a wash stand next to it. Remember there was no running water in most houses at this time. Here’s a detail shot of the beautiful Renaissance Revival style crib. 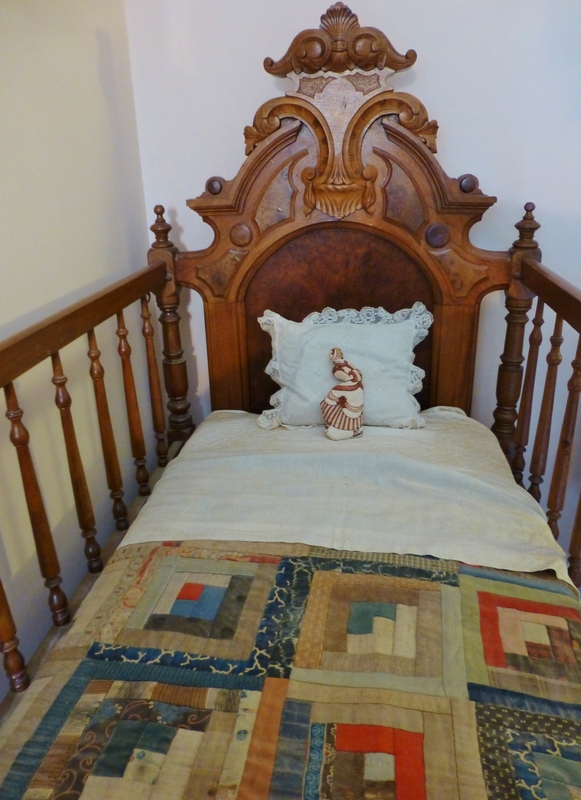 I admire the hand-made baby quilt and fine linens. 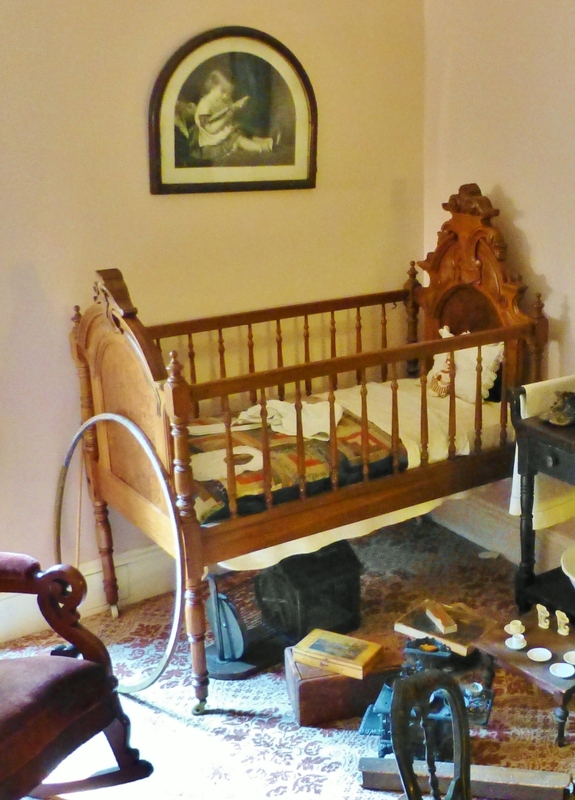 Notice the stick and hoop at the foot of the crib…this was a popular Victorian child’s diversion as were the other toys scattered across the floor. Beneath the crib is an antique squirrel cage–children would often keep squirrels as pets and enjoyed observing them running on the wheel, like hamsters. A handsome spool turned bed resides across the room from the fireplace. Notice the charming diamond-shaped window in the corner above the painted cottage dresser. Suites of this caramel colored furniture with chocolate hand-painting were very common in Victorian guest rooms and servants quarters. Notice the boxes on the top for storing gloves and collars. 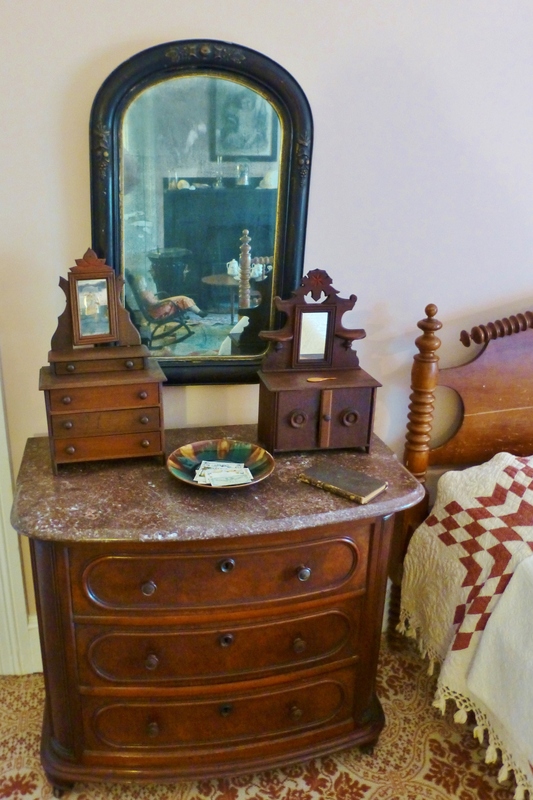 To the left of the bed is another pretty dresser, this one with a marble top. 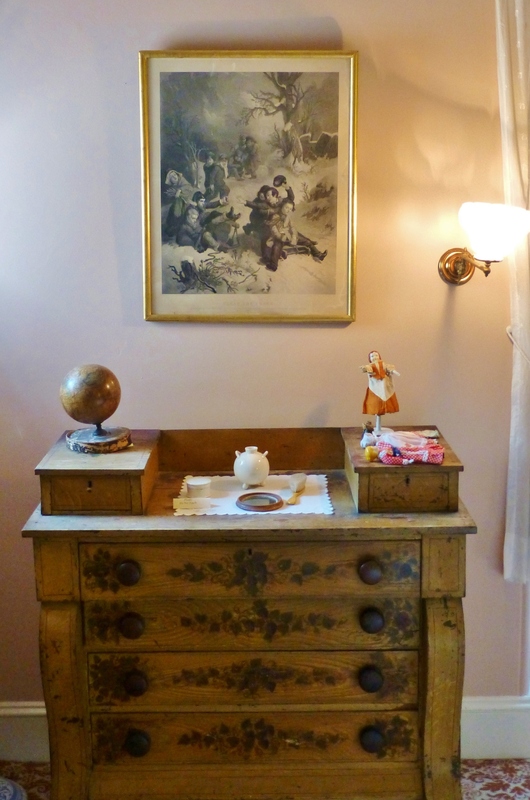 On the dresser sits two miniature dressers. This doll-sized furniture (along with salesmen’s samples) is quite collectible today. Aren’t they adorable?! 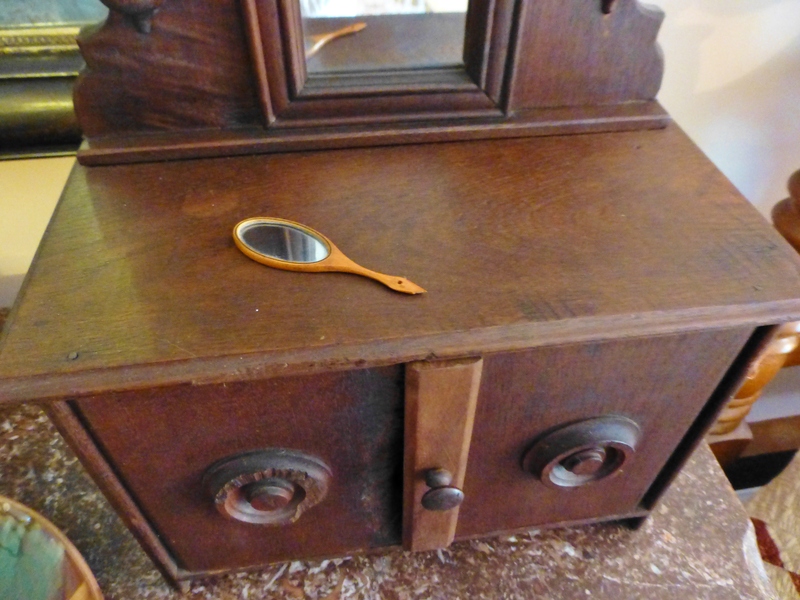 Even more cute is this very tiny hand mirror atop a miniature dresser! 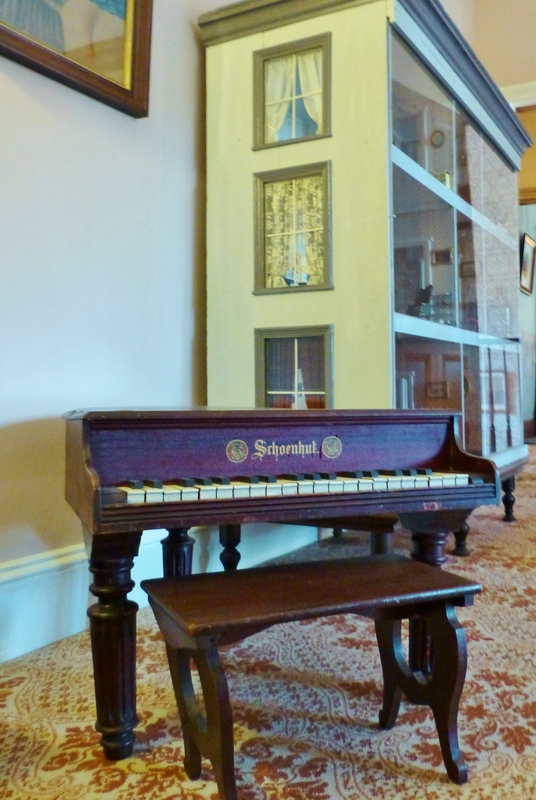 On our way out of the room is this lovely child-sized Schoenhut baby grand piano. Did you know there are groups of people who write and record music specifically for these tiny pianos? The children in this household were very fortunate…let’s check out that humongous dollhouse next! Here you see the quite large (around 5 foot tall) dollhouse, filled with antique miniature furnishings. Sorry about the glare, but the museum keeps plexiglass on the front for obvious reasons–who could resist reaching a hand inside to play with these little masterpieces? 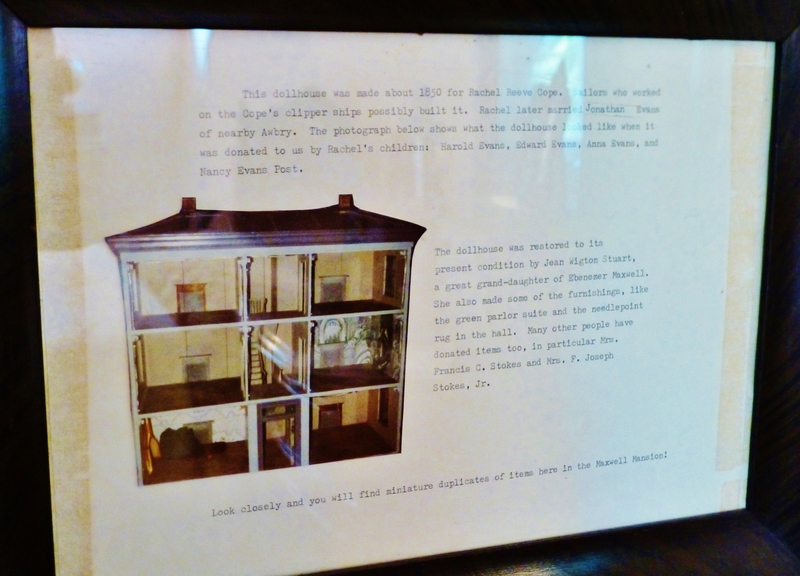 Framed on the bedroom wall is some info about the dollhouse, which was restored by a great grand-daughter of Ebenezer Maxwell and contains donations from many sources. 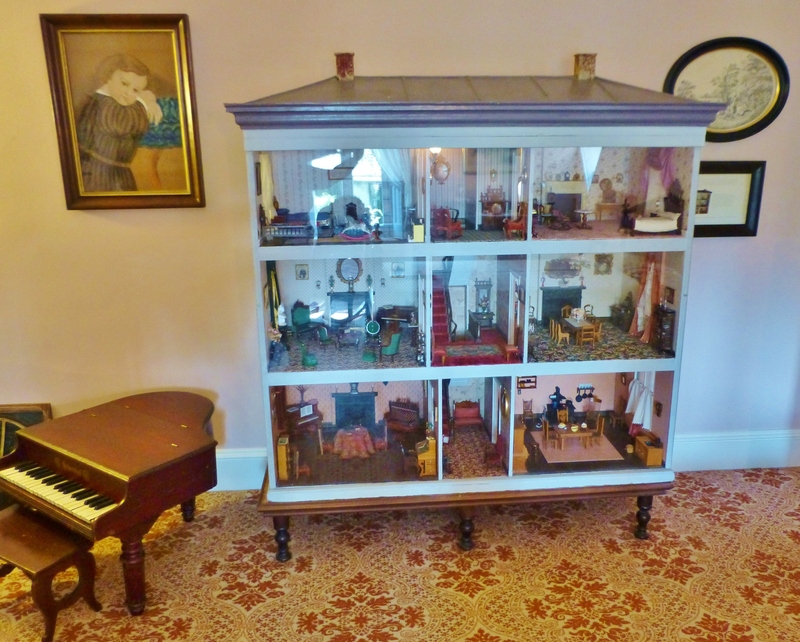 There are even miniature reproductions of actual pieces from the Ebenezer Maxwell Mansion inside the dollhouse! I’ll leave you with this selfie of me in the Children’s Bedroom at the Ebenezer Maxwell Mansion. 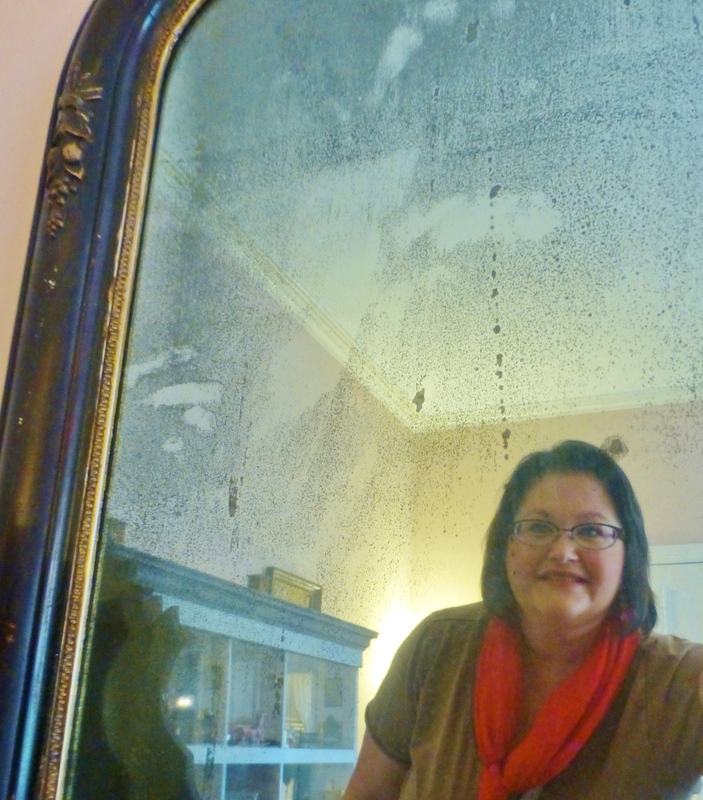 You can see the dollhouse behind me in the wonderful pitted and pock-marked antique mirror. 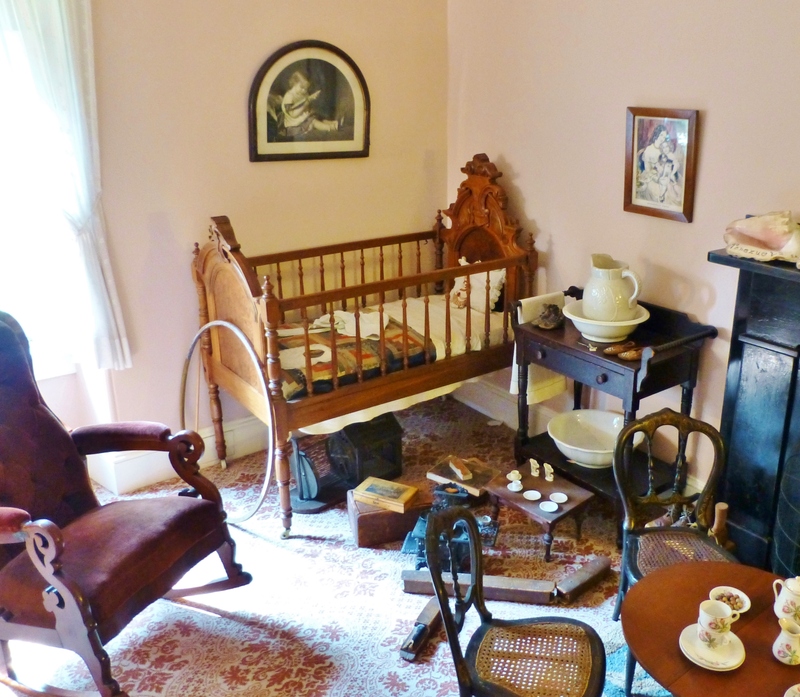 I had such a lot of fun sharing the Children’s bedroom at the Ebenezer Maxwell Mansion…isn’t it amazing to see how children lived and what they played with long ago? Next time I’ll share more of the hallway with you, and we’ll go into the main bedroom suite. Until next time, when I’ll share more of my exclusive feature on the interiors of Ebenezer Maxwell Mansion, please post your comments telling me what you think about the tiny Victorian furniture. I always love to hear from you, and I’m even more happy if you share my blog and tell your friends about me…I need all the friends I can get! 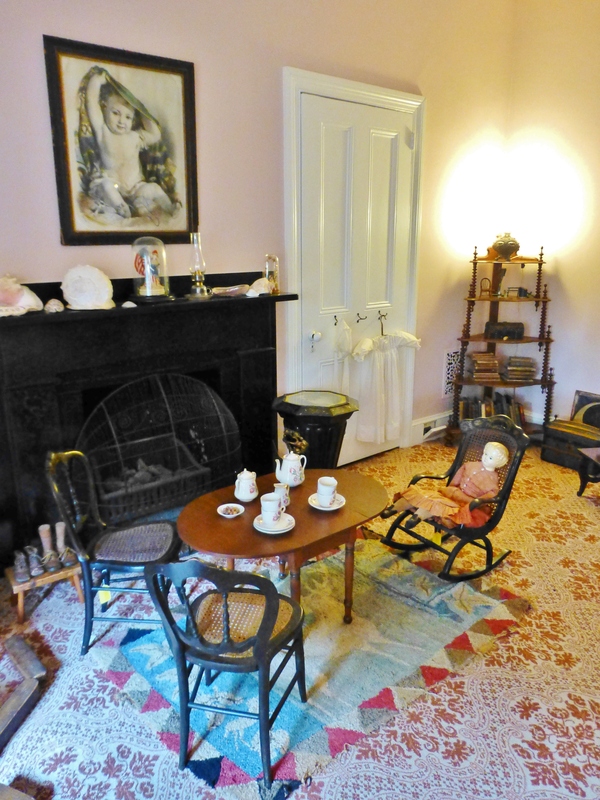 This entry was posted in Antiques, Interiors, Mansion, Miniature, Victorian and tagged Children's Rooms, Crib, Dollhouse, Dolls, Dresser, Ebenezer Maxwell, Furnishings, Furniture, Kristine Robinson, Robinson interiors, stairwell, Tea Set. Bookmark the permalink. I absolutely would have died to have a doll house like that as a little girl! It is stunning! Thank you for sharing! I know! Isn’t it gorgeous? And the tiny piano….just wonderful. Thanks for reading and commenting–you are always appreciated!